Many historical and significant people can be found by reading the street names of the Parkes Shire. Road names such as ‘Church Street’ and ‘Railway Sreet’ indicate close proximity to important town fixtures. Most residents would be aware that ‘Clarinda Street’ was named Sir Henry Parkes’ first wife, Lady Clarinda (née Varney) in 1887. The original name of Clarinda Street was ‘Forbes Street’, highlighting that roads can be renamed. However the street name parkeshistory will focus on today isn’t named after a local resident. Captain Wilson Avenue is a short road that connects Close Street and Middleton Street. It originally was intended to be called ‘Canberra Street’ – with side streets being named Melbourne Street and Sydney Street. 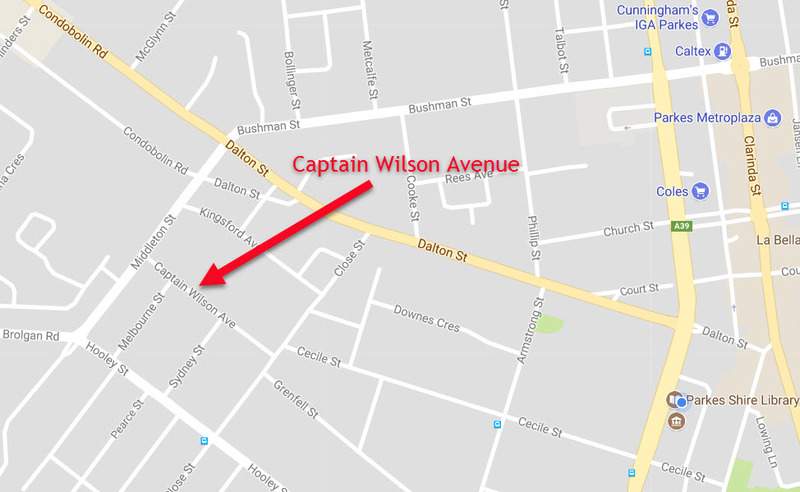 This post will look at who Captain Wilson was and why he was chosen to be honoured with a street named after him. According to information found on the Australian War Memorial website, Captain Wilson is held in the highest esteem amongst British and Commonwealth war heroes. 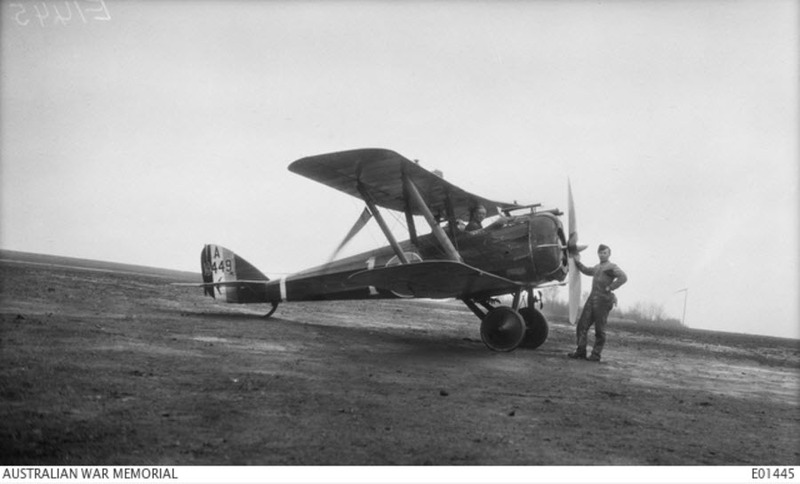 Of the many decorated members of the Australian Flying Corps only one , Capt G.C. Wilson had the the great distinction of having been awarded the Military Cross, Air Force Cross, Distinguished Conduct Medal, and Mentioned in Despatches. The combination of decorations is unique to an Australian and is not known to any other member of the British or Commmonwealth Forces. 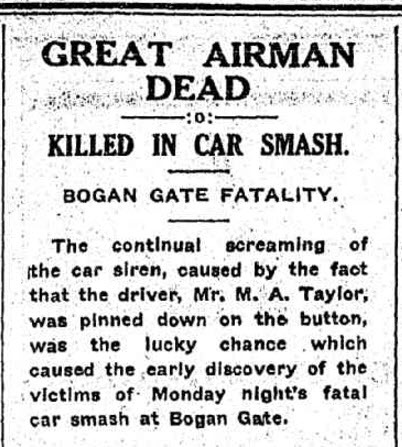 Tragically, Captain Wilson was killed while travelling through Bogan Gate. 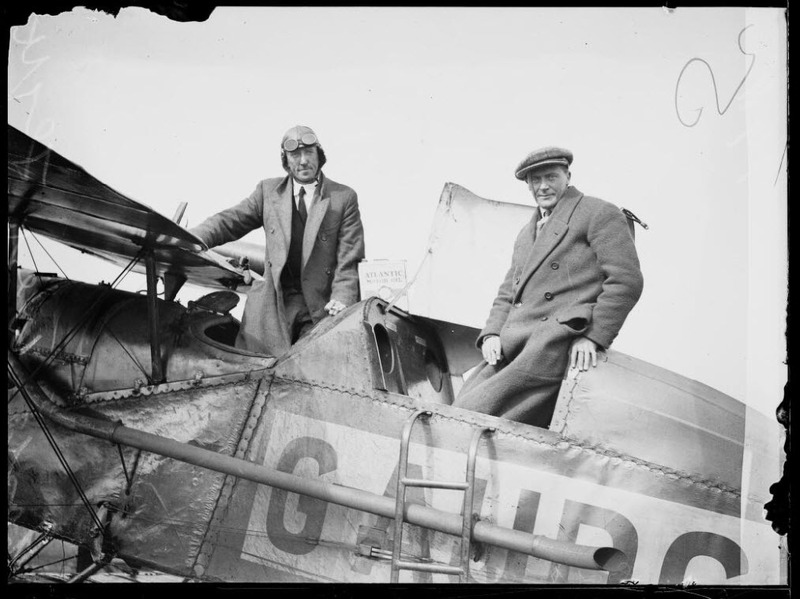 He was under employment of New South Wales Airways Ltd, and his two travelling companions – driver Mr M A Taylor and Mr N Bloomfield were also killed as a result of the accident. All three were sitting in the front seat. It is believed that at the time of his death, Captain Wilson was engaged to be married. 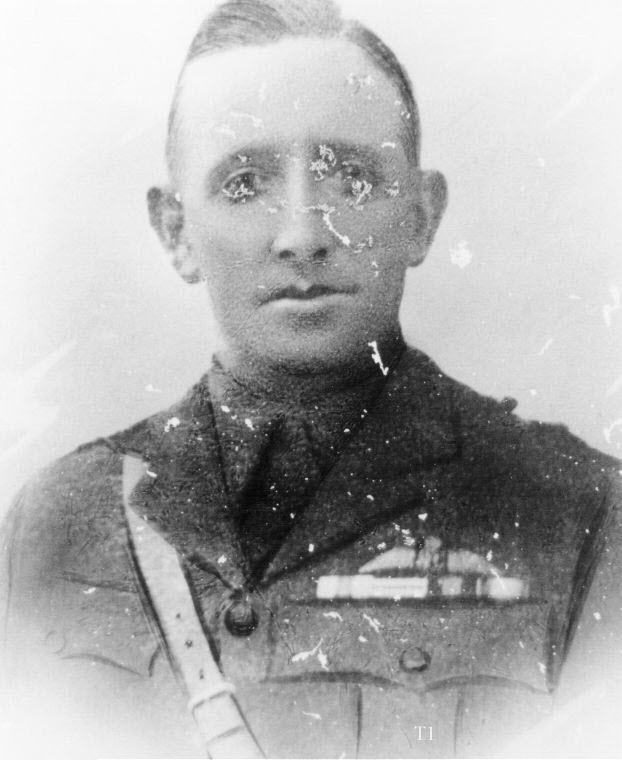 Captain Wilson had returned to Parkes, staying for about a week and renewing the town’s relationship with the heroic soldier. 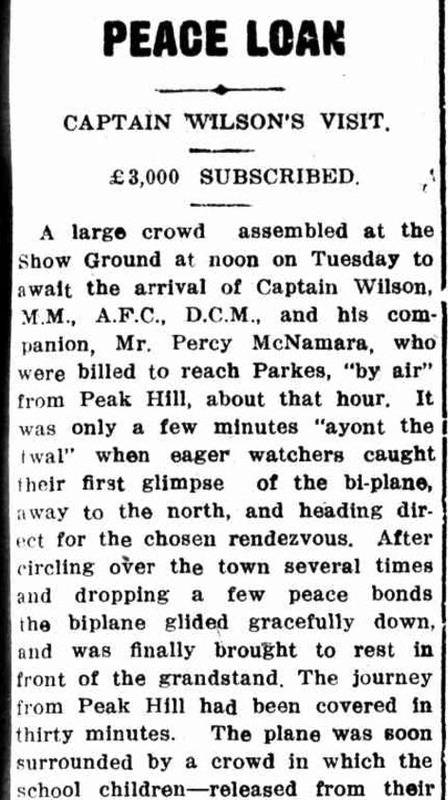 He was popular when recognised and as a result of his work aircraft rose in popularity among the general public. If you have stories or memories that you are willing to share about Captain Gordon Campbell Wilson and/or Captain Wilson Avenue please contact Parkes Shire Library via library@parkes.nsw.gov.au so that they can be shared and kept for posterity on this blog. Alternatively you may leave comments on this page. 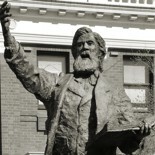 Alan Fraser, ‘Wilson, Gordon Campbell (1895–1929)’, Australian Dictionary of Biography, National Centre of Biography, Australian National University, http://adb.anu.edu.au/biography/wilson-gordon-campbell-9136/text16117, published first in hardcopy 1990, accessed online 17 August 2017. Clark, Rex. “Captain G.C. Wilson, MC, AFC, DCM, MID / by Rex Clark.” The Australian War Memorial, www.awm.gov.au/collection/LIB100011369. Accessed 18 Aug. 2017. This entry was posted on August 21, 2017 by parkeslibrary in 1910s, 1920s, Bogan Gate, cricket, General history, Legacy, local historical articles, Nurses, Parkes, tragedy, Uncategorized, war fund, Wiradjuri, World War I and tagged 39th Fortress Company, A Goinan & Co Ltd, Agnes Cecilia Wilson née Jackson, Air Force Cross, Alan Fraser, Australian Dictionary of Biography, Australian Flying Corps, Australian Imperial Force, Australian Military Forces, Australian War Memorial, Baizieux, Bogan Gate, Canberra Street, Captain Wilson, Captain Wilson Avenue, Charles Ulm, Church Street, Clarinda Street, Close Street, DCM, De Havilland 5, DH5 A9449, Engineers, flying ace, Forbes Street, Frank Buchan, Fromelles, Gallipoli, Gordon Campbell Wilson, Henry Momsen, Lady Clarinda, Lady Clarinda née Varney, landing in Parkes, Melbourne Street, Mentioned in Despatches, Middleton Street, Military Cross, Minmi, New South Wales Airways Ltd, Newcastle, Newcastle City Council, Newcastle Regional Museum, Newcastle Technical College, patternmaker, Peace Loan, Peak Hill, Percy McNamara, Railway Street, Scottish miner, street names of Parkes Shire, Sydney Street, William Wilson.